Winter in July | Is This Mutton? Christmas often happens in July. Magazines are already preparing their festive editions and press and retailers will be showcasing their wares to bloggers and journalists. And thanks to some canny sales shopping, I am also showing you a touch of winter in July. 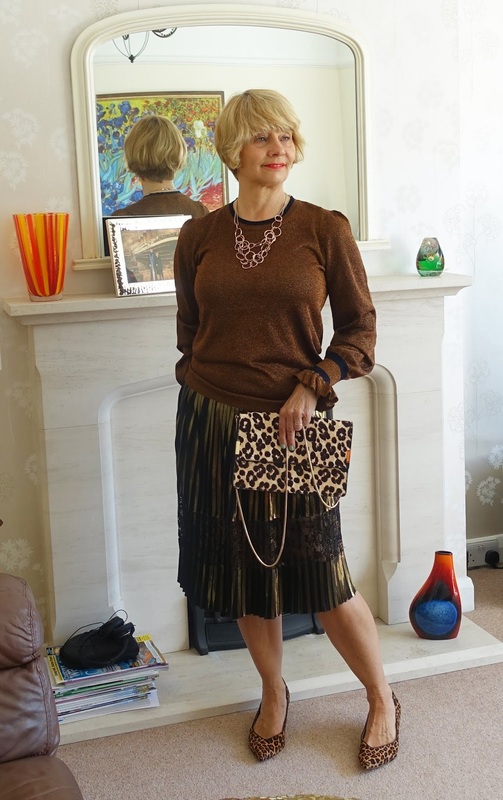 In my last post I talked about sale shopping and showed a couple of the items I had picked out from the sale at The-Bias-Cut.com, a site featuring contemporary and distinctive clothes, worn by women of all ages and sizes. In this post I'm showing three more picks, but they're winter selections. 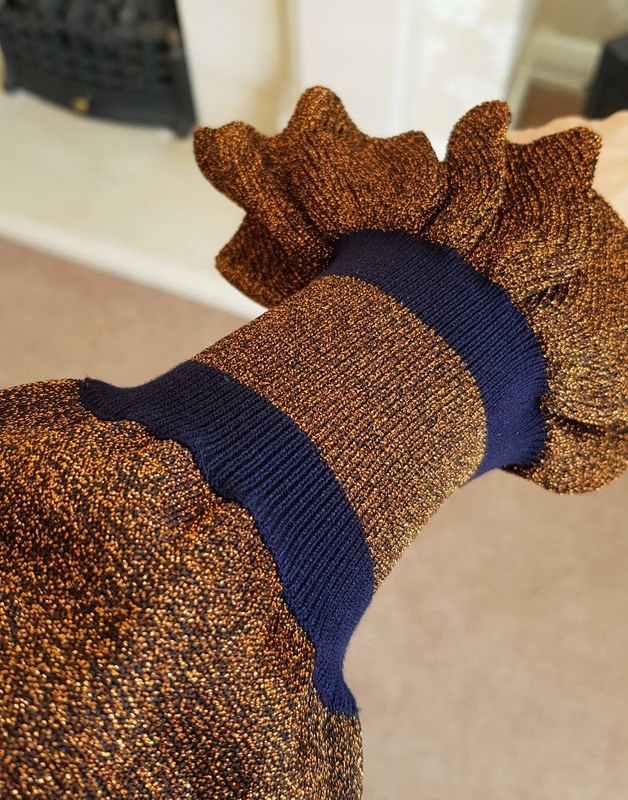 As I mentioned on Sunday, I often snap up bargains for another season in the sales, particularly if the clothes in question are timeless and brilliant quality. 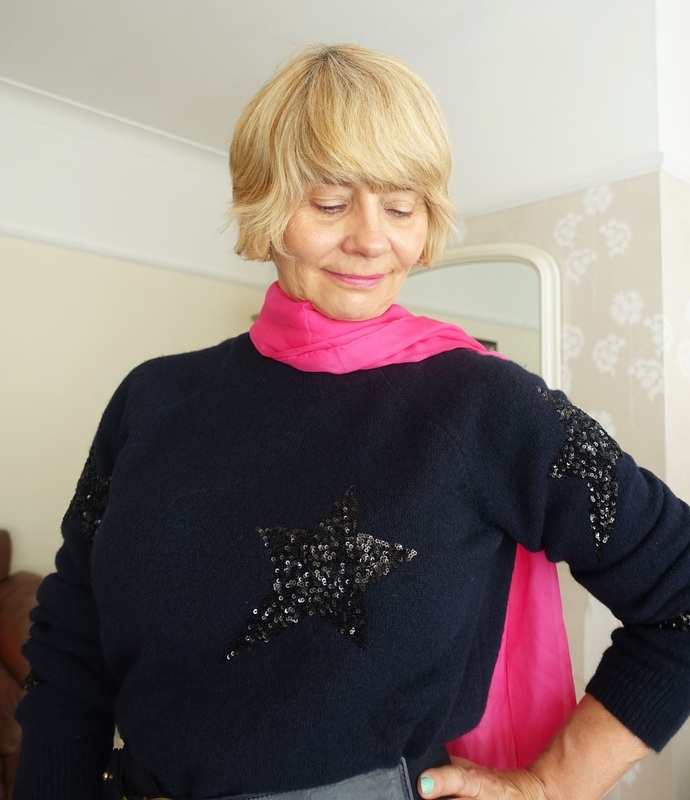 This Electric Star jumper (sweater) in midnight blue is a prime example. By Fabienne Chapot, it's wonderfully soft and I love how the sequin stars catch the light. I can see myself wearing it casually with jeans and in a more dressy way as I've shown here. Midnight or navy blue are not very flattering colours for me but it doesn't stop me from wearing them: I simply try to mix them with colours that do suit me, nearer to my face. Here I've added a fuchsia scarf and lippy. Now the skirt is a real find. 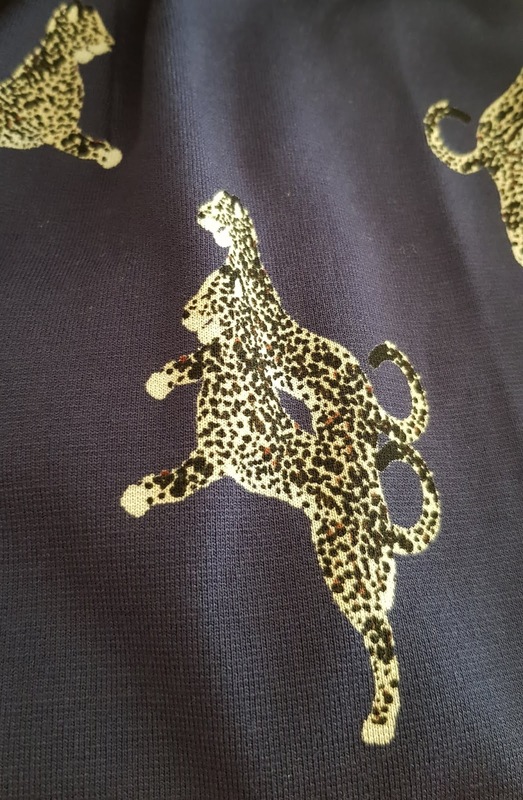 I was thrilled to find that the Jaycee skirt, decorated with big cats, is in the pull-on style with a stretchy fabric that hugs your curves. I'm always looking for skirts like this because they are so flattering. The cats print adds a touch of fun. I used a wide belt to cinch my waist, some attention-grabbing Poetic Licence shoes, and the most delicate tights I've ever worn from Oroblu. Another stunning jumper is the Carmel lurex knit from Baum und Pfergarten. Think of the gloom of winter, alleviated by twinkly lights, and imagine how this lurex fabric will shine. So that's it - my sales round up featuring The-Bias-Cut.com. I was gifted two items from the sale but I fell in love with all five of the items picked and decided to buy the rest! Sharing this post with #WelcometotheWeekend at Claire Justine, Fake It Until You Make It at Fake Fabulous, #IwillwearwhatIlike at Not Dressed as Lamb, Visible Monday at Not Dead Yet Style; Style with a Smile at Stylesplash; Turning Heads Tuesday at Elegantly Dressed and Stylish, #SpreadTheKindness at Shelbee on the Edge, Chic&Stylish at Mummabstylish, Top of the World Style at High Latitude Style, Fancy Friday at Nancy's Fashion Style. 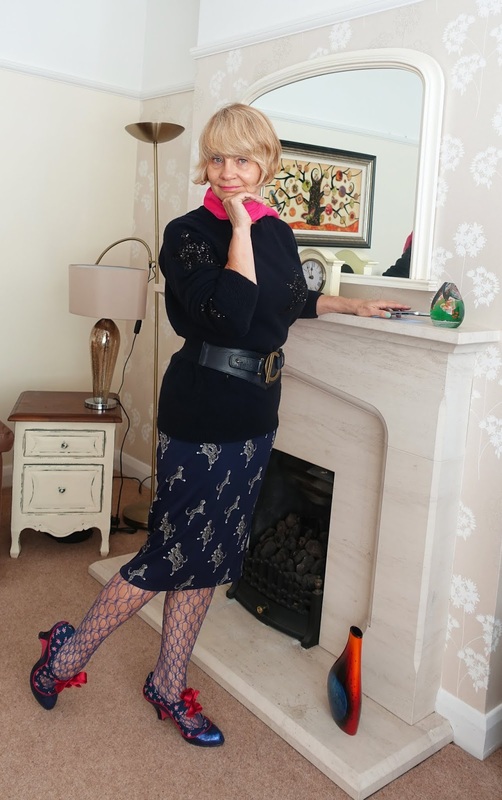 Fabulous Friday at A Pocketful of Polka Dots, Tina's Pink Friday, Weekend Wear at Threads for Thomas and Anything Goes Linky at My Random Musings. Don't miss a post - follow Is This Mutton? on Bloglovin or Feedspot. I post extra goodies (handbags and shoes) on the Is This Mutton? Facebook page. And check out the Is This Mutton? Pinterest boards, including boards on other bloggers in fab outfits plus beauty, jewellery, hairstyles and fashion picks. Is This Mutton? is also on Twitter. Gail you are going to love wearing these in the winter. Absolutely fabulous items. Blogger and Disqus on mobile devices do not get on, so you will only see all the Disqus comments if you view in desktop view. But please go ahead and comment, make my day! Sentence a Day: June 2018. A heatwave! Red Jeans with Leopard Blouse #Chicandstylish #LINKUP - Playtex GIVEAWAY!! !